If you landed here it’s a good chance that you might have a co-teacher and you’re curious about what 25 questions are listed to ask them. Great! I do a lot of work with educators highlighting the importance of relationships and providing strategies to continuously recharge them. One relationship that I think lacks the attention it deserves, is the relationship amongst teachers who work together in a classroom. Working together with another individual in the classroom is rarely second nature for most people. It requires a lot of intentional relationship building, communication, and respect. I had the pleasure of working with two different teachers during my teaching career. I had a great relationship with them both! One of them was a huge contributor to the success I had my first few years and the other was a huge contributor to the success in my later years. They taught me the power of a teaching team. Although they were both very different from each other, there are things that were consistent with how I interacted with them. I got to know them well, respected and appreciated them, and invested in them as people. I believe that learning how to build and maintain a positive teaching team is a skill that has to be developed just like anything else you do. I also came to realize that this is a struggle to do in many classrooms, so I developed a training titled, Recharge Your Relationships. This training helps teachers learn how to build and maintain three critical relationships. The very first relationship that I focus on is the teacher/teacher relationships. This is often overshadowed by the push to build teacher/child and child/child relationships but there are many classrooms that could benefit greatly from a stronger, more cohesive co-teacher relationship. I know many of my readers are in a classroom with a co-teacher, so I wanted to share one of the resources from the training that will benefit you! 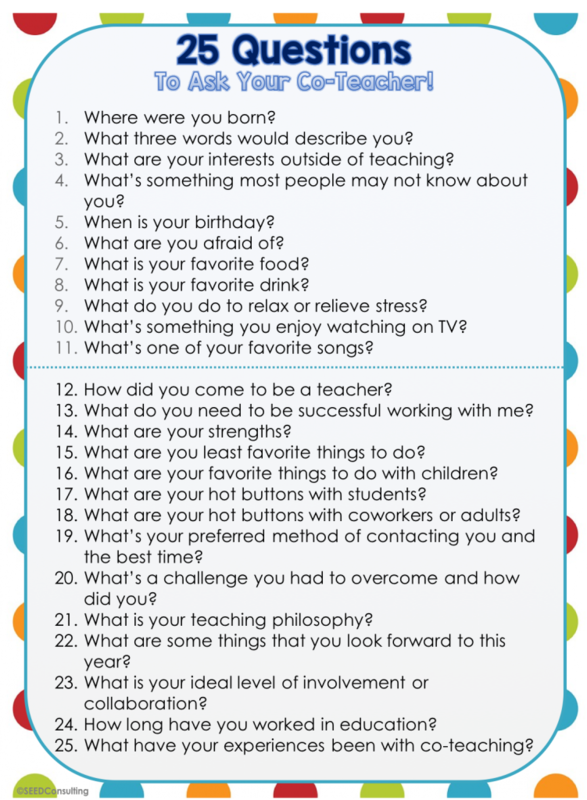 I collaborated with one of my co-teachers (once partners, always partners) to create a list of 25 Questions to Ask Your Co-Teacher! It was derived from our many conversations about things that she wished other teachers she worked with knew about her and that I took time to learn. After getting off the phone one day, I thought maybe there should be a guide of different things you should learn about your co-teacher. After that brief thought, I began to put the idea into action. Between my co-teacher and I, we came up with 25 questions that fit into two categories. One category has questions about the teacher as a person and the other category has questions about the teacher as an educator. Take a look at what we came up with and see how you can incorporate this into your relationship building throughout the year! Keep in mind that this resource is not meant to be used to interrogate each other all in one sitting! 😳 These are just questions you should know by the end of working with someone after a year. I truly believe that using the information from this guide will be the key to working together well and complimenting each other! Many teachers have loved this resource in training, so I hope you will love it and find it helpful too!